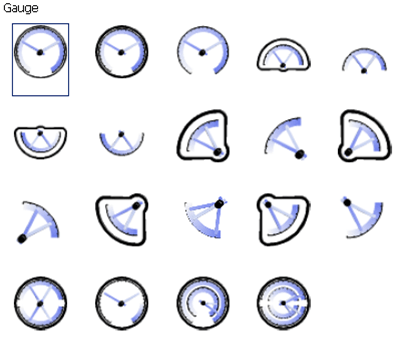 Let me start by saying an obvious thing: Gauge charts do deserve some recognition. Actually, they deserve a medal – a medal for being the most controversial chart type in history. When I first saw a gauge chart, I was impressed. They looked pretty cool. Things changed when I got involved with my first BI project. A closer look revealed that these charts are actually pretty tough to look at. But let’s back up and start from the beginning. Feels like driving a car? They take up a lot of space. That is highly relevant for a dashboard where we are dealing with some space constraint. They do not reveal a lot of information. The only thing we can learn from the five gauges above is that most plants are above plan. That’s it. We could have put that into a tiny table. Other valuable context such as history is not provided. We are basically not getting a lot of bang for the buck. They work best for single data points. Putting multiple needles into a gauge not only looks ugly, it also makes it extremely hard to read. Take a look at the example below. 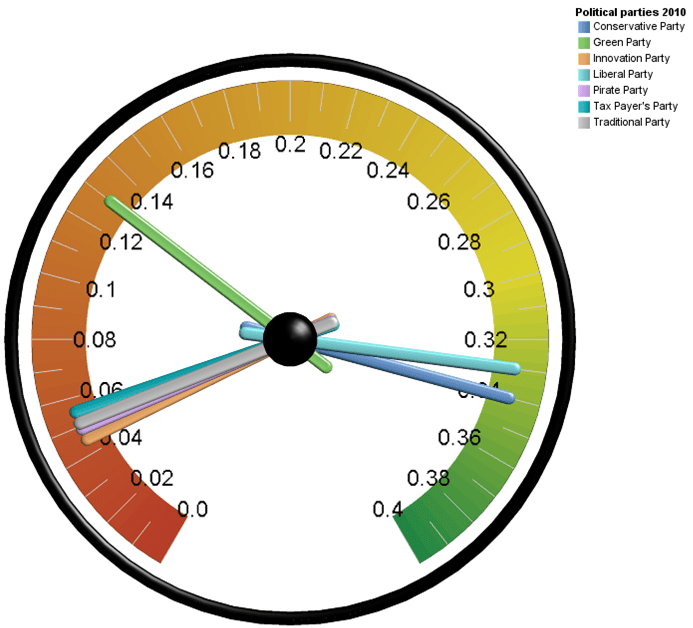 The gauge displays the election results for a few fictitious parties. This stack provides a lot more information than the original gauge: target for each party, shaded areas to rate the performance. 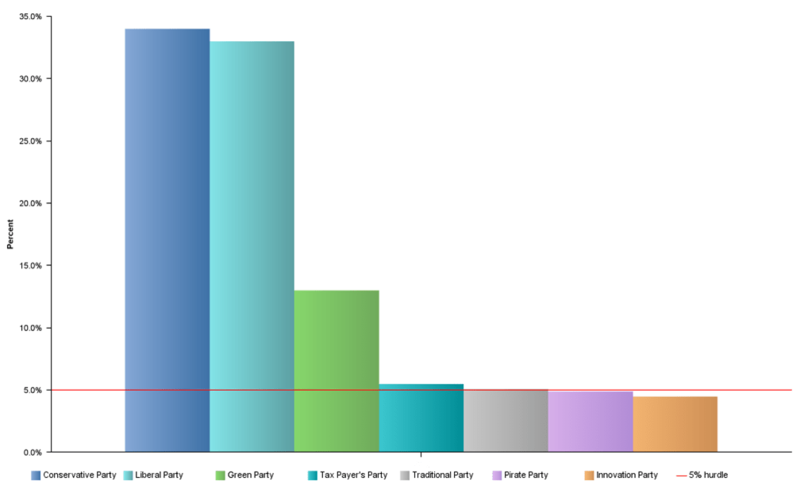 Also, it is pretty easy to compare the different parties. We could further add some sparklines on the side to add historical context. Both alternatives take up less or slightly more space. They are more effective at providing information and they are easier to read. Most people would agree that gauge charts are inferior to other chart types. But many executives and business users ask for them. What to do? Based on my experience, it is best to show alternatives and to educate. Charts like the bullets above are relatively new and we cannot expect users to adopt them outright. But it is worth the effort to instigate change. I have had a few situations where my team had to challenge requests for a Ferrari-like dashboards. It was hard work to educate and to gain acceptance for the alternatives. But I believe the executives are much happier with the non-gauge version. IBM Cognos 10 provides a very powerful charting engine. There are over 160 different chart types available. Gauge charts are obviously part of that. Finding an appropriate type should therefore not be too difficult. Gauge charts are very polarizing. Some people love them, others hate them. I personally do not find them very effective. When it comes to designing a dashboard or a report, we should select the type of visualization that gets the job done. I therefore highly recommend looking at some alternatives. But we all have different tastes & preferences.